We carry all the parts for the UPM 45 Pitching Machine. Also know as the Blue Flame, Louisville Slugger Ultimate Pitching Machine. Parts are listed in the labeled UPM 45 diagram. If you have questions please call. This is a 10 pack of Spring Kits for the Louisville Slugger Ultimate Pitching Machine. It comes with 2 Rubber Runner for the Throwing Arm and 2 bolts and nuts to attach the spring to the Throwing Arm Bracket and the Spring Bracket. This is a ball shield replacement part for the UPM 45 Pitching Machine. It goes on top of the Release Handle and is held on by two screws. Base Tube End Caps, These are the Rubber caps that are on the Stabilier Bar and the Base Tube. All are the same size. This is used on the Louisville Slugger Ultimate Pitching Machine to attach the Stabalizer bar to the Base Tube to form a T.
The Micor Adjuster goes on the throwing arm and is used to adjust the height of the pitch. If you would like a lower pitch you turn the screw to make it shorter. And if you would like the pitch to be higher you turn the screw to make it longer. The Louisville Slugger Ultimate Pitching Machine Power Lever. This is the bar you step down on to load the spring before you pitch the ball. 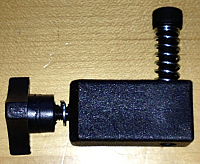 It attaches to the Spring and the Base Tube with Bolts. $19.00 and free shipping on 10 or more springs and 1-3 day delivery USA. Replacement Spring for the UPM 45 pitching machine also known as the Blue Flame 45 and the Louisville Slugger Ultimate pitching machine. This is also the power spring for the Louisville Slugger Black Flame pitching machine. Just the spring. The pitching machines will gradually throw slower over the season as the spring get tired. Springs should be replaced every year as they will wear out with use. This is the spring that powers the pitching machine. This is the replacement Spring Kit for the Louisville Slugger Ultimate Pitching Machine. It comes with 2 Rubber Runner for the Throwing Arm and 2 bolts and nuts to attach the spring to the Throwing Arm Bracket and the Spring Bracket. Your Choice, choose either the Pull Pin with Ring $3.00 or for $4.00 the Pull Pin with the Knob for easier spring setting changes in the drop down. Louisville Slugger Ultimate Pitching Machine Replacement Part Grip for Release Lever . This the Grip that goes on top of the Release lever that you pull back on to throw the ball. Rubber Runners that go on the throwing arm of the Ultimate Pitching Machine or UPM 45. Order is a set of two rubber runners. Spikes for front stabilizer bar on the Louisville Slugger Ultimate pitching machine also known as the UPM 45, and the Blue Flame. The are also used on the Black Flame Pitching Machine. Spikes are sold as a set of two. This is a complete spike set including the washers. The Slanted Wedge goes on the end of the throwing arm of the Ultimate pitching machine. This slanted wedge pushes against the Support Block when the throwing arm is cocked. The UPM Slanted wedge adds a few miles per hour pitching speed over the old mode. The Spring Bracket attaches to the power spring and then to the Power Lever using the pull pin, on the Ultimate Pitching machine. Ultimate pitching machine replacement part Support Block with Knob. Description: This is the black rectangle piece that is attached to the upright handle which the Throwing Arm presses against when cocked to throw. You are purchasing the release block and the Star Knob that holds the release block in place. 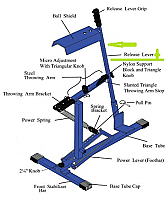 Throwing Arm Bracket for the Ultimate Pitching machine or the UPM 45 pitching machine. The Throwing arm bracket is attached to the Throwing Arm and is connected to the power spring with bolts.